Being that I’m on my Apple or Dell laptop almost everyday I know what every key taste’s like! 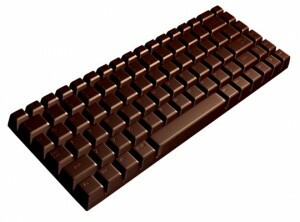 Over at Idealist Dream Object blog I’ve seen a mock up of a chocolate keyboard. Millions of chocolate fans I’m sure would get a kick out of crunching down on each key! It reminds me of a super sized Hershey Candy Bar. I’m not sure if you can purchase it or if it exactly exist, but what an idea! Originally designed by Sholk.com who designs and make different concepts! Well done! I think everyone with a computer and a sweet tooth would want one of these! Now there’s a mold I’d like to get a hold of!